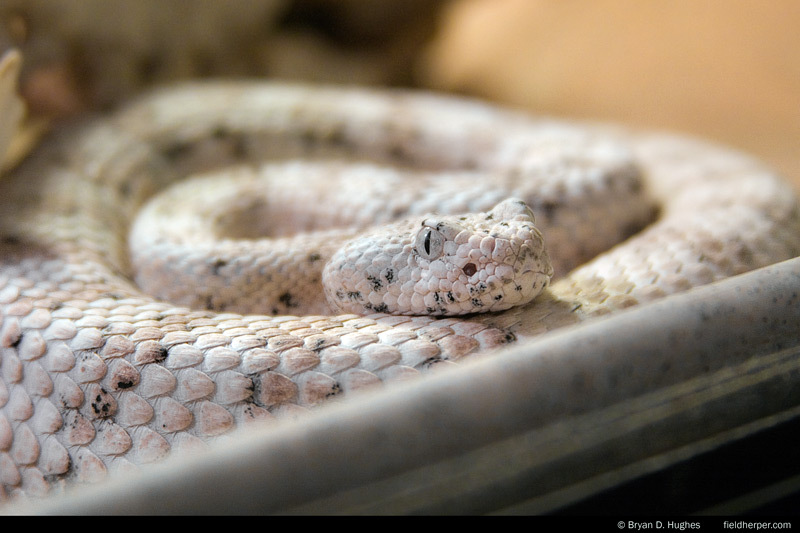 Here’s a photo of a female speckled rattlesnake that I have in my office … she’s ridiculously beautiful as you can see. She’s also recently been quite friendly with the big male of the same variety and coloration that lives with her, so friendly in fact that I expect some babies in a few months. Exciting stuff! This entry was posted on Monday, March 28th, 2011 at 8:12 pm	and is filed under Captive & Husbandry, Personal. You can follow any responses to this entry through the RSS 2.0 feed. You can leave a response, or trackback from your own site. Wow, that is a ridiculously nice looking mitchelli, Bryan! Is that their natural color, as though they were meant to blend in with a white granite, or is it a specially bred color morph, like one sees with corn snakes? Very nice and well done Bryan! I am sure babies are spoken for, but can I be put on a list if you have one? Hey, Bryan. I had no idea you had a breeding project w/ white specks! Very nice. Like Norm, I have to ask, do you have any plans to gift any progeny? I only keep the one cerb, but I would DEFINITELY make room for a beautiful creature such as these. If you have any left over after the mile long waiting list (I’m quite sure it MUST be!lol) I would love to adopt one. I never check my e-mail, but you can find me on the AHA site. Thanks, Bryan. What a beauty. Did she ever give birth? She’s cooking the second clutch still … any day now.